I'm glad to her from you again after so many days of absence, I knew you were terribly busy..
Oh My, what would I give to peek at those cut material!!! Anyways, I hope your book gets done and published soon. Infinite thanks for all your hard work! I can't wait for BRE! If I can ask a question. Is one of the reasons eastern Africa becomes preeminent because the equator and an an eastern coast are ideal for space launch? (ie. you can use the Earth's angular momentum to minimize the amount of energy needed to reach orbit if you launch east from the equator). Congratulations on the nomination. Overdue, in my humble (yet valid) opinion. Ah, more AR books to be read. What's not to like? 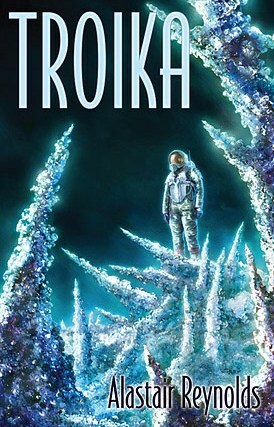 Will you be making "Troika" available on-line, as has been done with the other Hugo-nominated novellas? Congratulations on the nomination. Just downloaded Voices from the Past, so looking forward to that. Is Troika / Has it been published in the UK at all? Gus - that's a factor, although just one of several. Anon (and Monkey Biscuit) - I won't be making Troika available, no, although it will be part of the Hugo voter's packet. There won't be a UK edition for a while, I suspect. You can get Troika in the anthology "Godlike Machines" by John Stahan. It's supposed to only be available for SFBC members, but there are plenty of used copies on amazon. I've read many of your superb novels. While their average length is OK, I find that their endings can be too brief, e.g. in ARK and GAP. In your other novels the balance struck me as being ideal. Every time I read of authors cutting chunks of their work it saddens me a little. Any chance with the raise of eBooks, that cutting for length will go by the wayside? Anon - it's not cutting for the sake of fitting a certain medium, though. I wouldn't cut something if I felt it was better left in. My publisher would be fine with me handing in a 250,000 word book, and I'm sure they'd find a way to handle a 300,000 word book if I was so inclined. When CDs came out, bands quickly learned to exploit the possibilities of the form by releasing 70 minute albums with 15 or 16 tracks on. But most of those albums now strike me as bloated and self-indulgent, and the worthwhile artists have gone back to the old format of 10 or 11 tracks over 45 minutes or so. Obviously there will always be individual works which demand a sprawling canvas, but I'm firmly of the opinion that there is a natural length for most things. Dear Mr. Reynolds…The information about your soon-to-be-released novel "Blue Remembered Earth" that appears in your Wikipedia profile states that the African continent will be featured as a "spacefaring, technological super-state". The idea of such an historically beleaguered continent (at least after its effective conquest in the wake of the Berlin Conference of 1885) rising up to join the West in the exploration of the The Great Beyond is absolutely and positively the most thrilling announcement concerning an upcoming work of speculative fiction that I’ve heard about in a long time. I mean, sir, that I can hardly wait for this. Somewhere in the 70's, I believe, the renowned Senegalese physicist, anthropologist, and historian of African antiquity, Cheik Anta Diop, wrote a book entitled, "Black Africa: The Economic and Cultural Basis for a Federated State", which expounded with the highest degree of optimism on the possibilities for Africa's technological development in all spheres of scientific inquiry upon achieving continental unification in language and political structure. It’s an incredibly interesting essay bursting with the most enthusiastic yet pragmatic speculation on the contribution that a united Africa could make to the world in its application of advanced technology, especially for humanistic ends. It goes a long, long way towards modifying the perception of African peoples SOLELY as diseased-ridden, superstitious, technologically-backward “primitives” who are unable or unwilling, even, to participate in the creation and development of a future global society. To my mind, the darkest thing about Africa is only what we don’t know about it. I strongly recommend Cheik Anta Diop’s book to you and to all of us, your readers, who are anxiously awaiting the publication of “Blue Remembered Earth”. By the way, Mr. Reynolds, the proposed title of your work conjures up in my mind images of a serene, almost pacific sort of “high” technological future that the late Arthur C. Clarke imagined when he said that “any sufficiently advanced technology is indistinguishable from magic”. It would be the kind of future where Mother Nature herself embraced, accepted and absorbed, rather than rejected the machinery of technological innovation, because Man will have found a way to place it in the world so that Nature would not react to it as threat to her existence. Nonetheless, even if your novel doesn’t concern itself with that Utopian vision, I’m still looking forward to reading it. Thank for making yourself available to your readers through this blog. I wish you well, sir. Loren: I hope you like the book when it appears. Utopianism is certainly one of the themes running through the trilogy, and if some of Clarke's thinking has rubbed off on me in the title, I couldn't be happier. Thanks also for pointing me to Cheik Anta Diop, of whom I was ignorant. I have to stress that my choice of Africa (actually Tanzania/Kenya) as the setting for parts of the book, and for the place of origin of its main characters, was motivated solely by an intense enthusiasm for African music - although it was initially west African music that did it for me, as it happens (Mali, desert blues etc). But nothing I've read since has dented my sense that there is a scope for optimism, in the long term. My main guide in attempting to get a handle on the current geopolitical situation has been Richard Dowden's book "Africa: Altered States, Ordinary Miracles"; it's a marvellous, unflinching read. It doesn't downplay the problems on any level but it does take pains to celebrate the successes. It's the book where I first heard about the African telecomms revolution, for instance. I am a composer, and I find it intriguing to hear that music was one the things that motivated your choice of Africa as a setting for "Blue Remembered Earth". Well, good-bye, Mr. Reynolds! Thank you for responding to my post. My name is Adrian and I live in Costa Rica. I recently got a copy of Godlike Machines mainly to read your novella Troika, and was very surprised that the star ship the Tereshkova used a VASIMIR reactor. Dr Franklyn Chang Dias is Costa Rican too, and one of our greatest and iconic characters, from his outstanding role as astronaut and also because of his Ad Astra project for the VASIMIR reactor. I wondered is this was indeed your inspiration? Pd, dying to read BRE!! Where do I find Troika in electronic format? I have abandoned paper books completely and can't find Troika in electronic format. The Amazon website has some sort of indication your publisher (or you?) do not want this published electronically? Why? I normally use iBooks, but if needed will settle for Kindle. It's not that anyone doesn't want it published electronically, it's just that it hasn't happened yet and won't do so until the right contract and offer comes along. Griffindell - you're right, that's where I got the idea from. Glad you enjoyed the reference, I'm very excited by the concept and hope the technology proves itself.